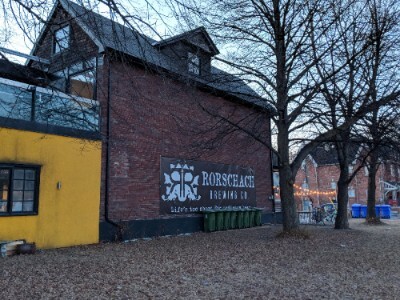 After getting over the tongue twister that is the name of this brewery, I eagerly went to explore what the far east of East Toronto had to offer. 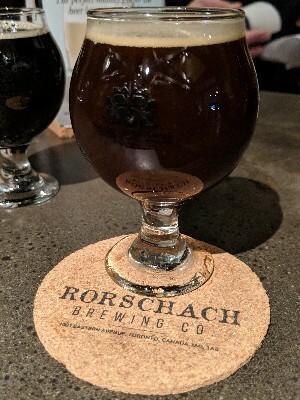 Though you may not find much towards the far reaches of Leslieville, what you will find is Rorschach Brewing. What is a Rorschach? Well thankfully, they tell you. You know those ink-blot tests where you try to see images in an abstract black blob? That’s a Rorschach test. Psychology lesson aside, this brewery is great! As you approach the venue it looks like this tiny little house, but the space is actually massive. 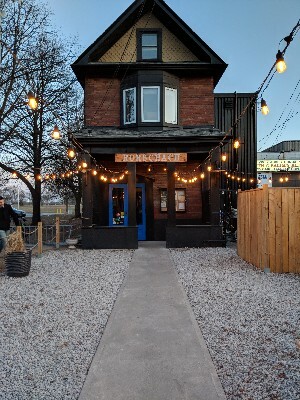 You may feel inclined to stop at the bar near the front, but the back restaurant spans for quite a ways. When we stopped here I decided to give three different beers a try. This was the first brewery I’d visited where it seemed I could try less beers than more. Unfortunately, they have lactose in a lot of their beers. This is why its so important to ask! That said, the ones I could have were mmm-mmm tasty! The first one I tried was Tenacious Vexation (and yes, they all have cool names). This beer was right up my alley. Dark, malty, and full of flavour! It’s a dark lager, and coming in at 6% a couple of these could have you feeling quite relaxed! The second beer I had on our visit was Latent Construct Coffee Oatmeal Stout, and I was so happy! 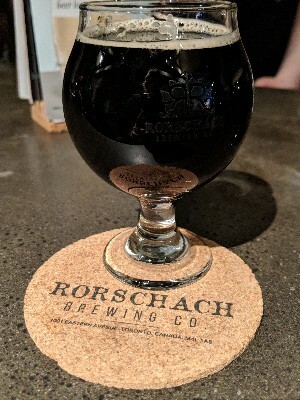 All their other stouts had lactose, but this baby was all mine. 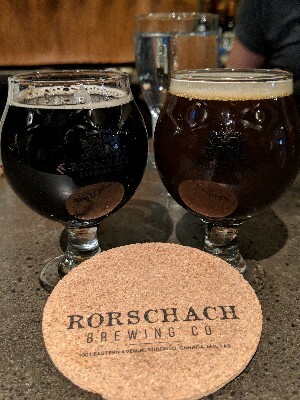 It was so smoothe and coffee-y, it’s the perfect type of beer to have on a quiet, rainy night (kind of like the night I’m writing this). 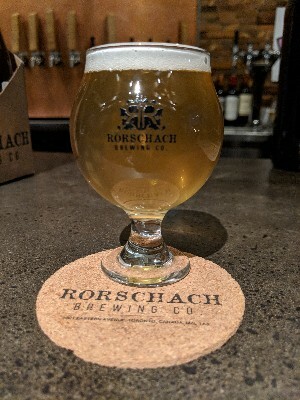 The third and final beer I tried while at Rorschach was Nostaliga, a grisette. While it may have been my least favourite, that’s like picking the worst of the best. They were all so good! This one was (clearly) a lighter beer, and had a grassier, more banana flavour. But if patio season ever comes around, this beer will be drank again! As I said earlier, the brewery itself is super nice! The old building adds a neat touch, and it’s huge! When we were there there were three parties, and you’d never have known it (we were at the front bar). They also have fun themed nights, including music trivia every Wednesday! The choice of vegan food options isn’t great, so be prepared to eat before, or modify heavily, but the beer is good enough that it’s definitely worth it! If you happen to go on a Wednesday, you may even see me!